As in life, what a difference a few days can make in the desert. 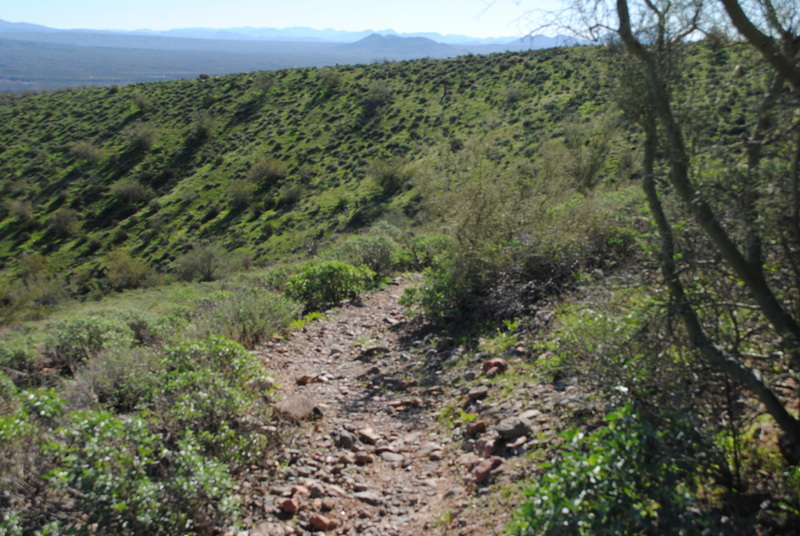 With about 22 thousand acres, and over 80 miles of trails here at McDowell Mountain Park, Bill and I love getting out and hiking three to four days a week. This first picture below was taken just last week when the desert was lush and green after the unusual amount of rain we had over the winter months. 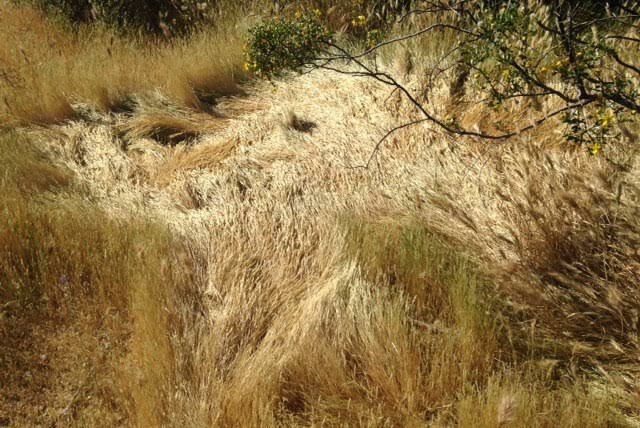 However, summer is fast approaching, and today Bill and I noticed most of the lush green is turning brown and drying up as shown in this picture. 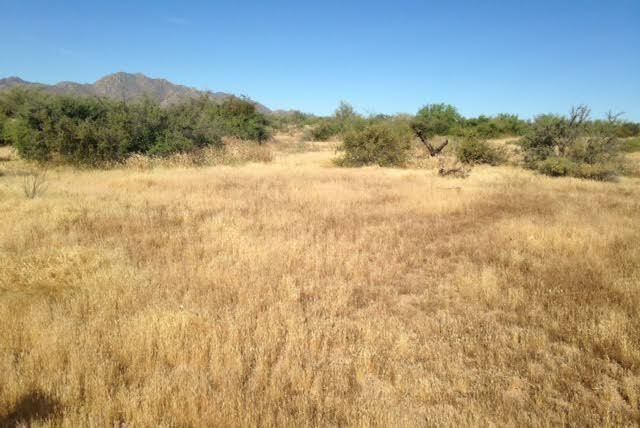 The dryness makes it easy to spot areas all around like this, where the grass is matted down due to what we think are places where some of our desert animals bed down for the night. But, I’m going to ask our park ranger if she agrees with that thought process or not.. 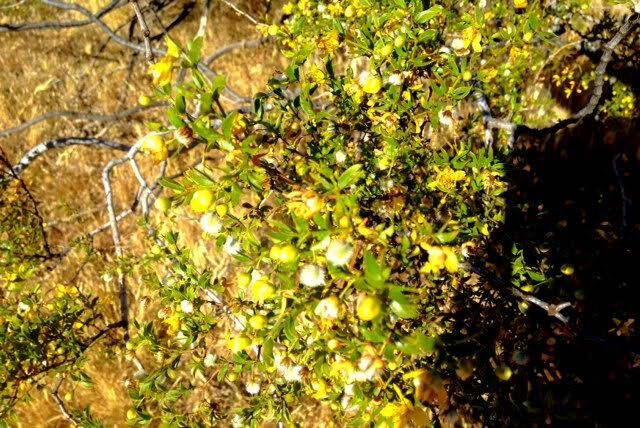 There are still some signs of spring left to be found, like this blooming creosote bush. A pretty desert bush with yellow and white flowers. I read up on the creosote bush on About Travel by Phil Persson, and here are some interesting things I found out. “Creosote leaves are coated with a resin to prevent water loss in the hot desert. The resin of the creosote bush also protests the plant from being eaten by most mammals and insects. It is believed that the bush produces a toxic substance to keep other nearby plants from growing thus ensuring its own survival. The creosote leaves give off a very unique and peculiar odor when it rains. Although some refer to the odor as heavenly essence of the desert, the Spanish word for the plant, hediondilla, means little stinker, signifying that not everyone considers the odor heavenly to the senses (I like the smell of the creosote plant). The plant was a virtual pharmacy for Native Americans. It was used in a tea to cure such things as flu, stomach cramps, cancer, coughs, colds, etc.”. Well, who knew all that could come out of one desert plant! 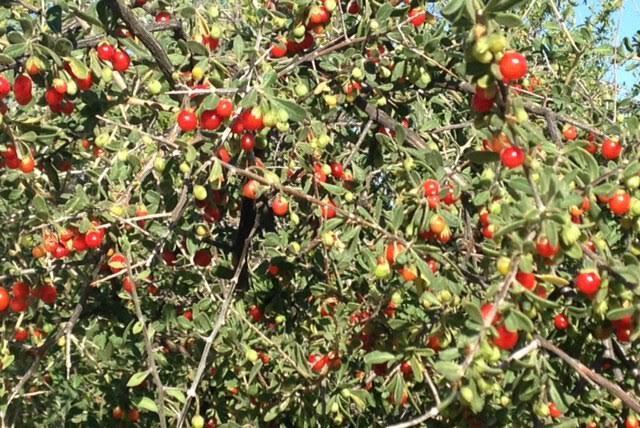 Bill and I don’t know what the little red berries on this thorny bush are, but we think they must not be edible or the birds, and other desert critters, wound have picked the bush clean by now. Another question we need to ask our park ranger. So much to see and learn here in our beautiful Arizona desert..
Our time here for this season is quickly winding down. Bill and I are leaving on April 26th to spend a month in Camp Verde Arizona, where we will just rest and relax until we head out to Oregon for the summer months. We will return to McDowell Mountain Park in October. We will be looking forward to another fun-filled hosting season, and reuniting with all the new friends we’ve made here. Stay tuned for postings of our summer adventures! Great post! I too love the smell of the creosote! I’ve always thought the same…that the grasses when are matted the animals had been bedding down, so you’ll have to tell me what your park ranger has to say. Can’t believe how fast this winter has flown by…but so looking forward to having some time together in Oregon! Fingers crossed! Love you two!